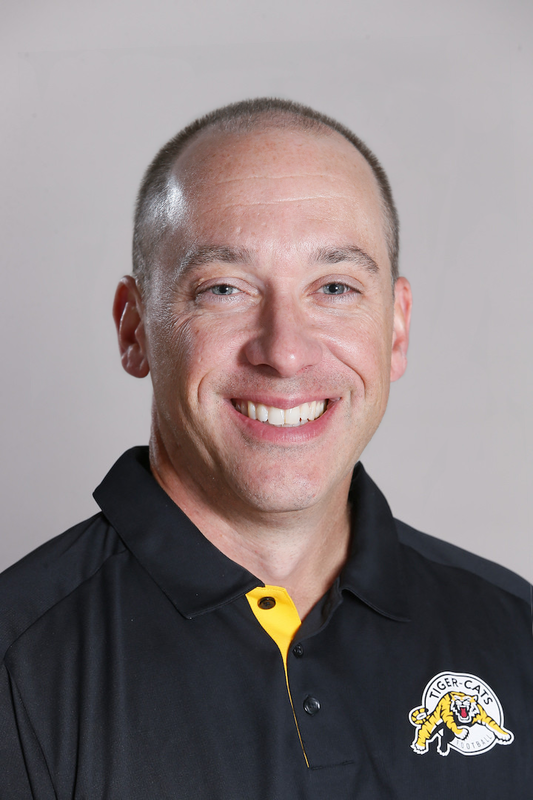 Tommy Condell was named Wide Receivers Coach of the Hamilton Tiger-Cats January 16, 2019. Condell spent the last two seasons with the Toronto Argonauts, serving as the club’s Offensive Coordinator and Receivers Coach in 2018, and Receivers Coach in 2017 where he was part of the team’s Grey Cup Championship season. Prior to the joining the Argonauts staff, Condell served as Offensive Coordinator and Receivers Coach of the Tiger-Cats for three seasons (2013-15). During that span, Hamilton’s offence ranked at or near the top of the CFL in numerous categories. In 2015, the Tiger-Cats had the CFL’s top ranked passing offence and scored the second-most points on offence (438) despite starting four different quarterbacks (Collaros, Mathews, Harris, Masoli) due to injury. With a passing efficiency rating of 102.5%, Hamilton’s offence accumulated the league’s second-most yardage (5,148) and touchdowns (tie-32) through the air, while adding the third highest completion percentage (68.0%) with the second-least interceptions (14) of any team. In 2014, Condell’s offence ranked fourth in points (417), first downs (342) and yards per game (330.8), and second in passing yards (4854), passes completed (402) and completion percentage (64.6%). In his first year in Hamilton, Condell guided the offence to top-three finishes in several key offensive categories, including ranking second in most first downs (397) and average yards per game (373.1). Before arriving in Hamilton, Condell spent three years at Cornell University alongside Kent Austin as Assistant Head Coach and Wide Receivers Coach. Under Condell’s watch, Cornell’s offence set a school record by scoring at least 24 points in eight consecutive games, while establishing 11 total new school records, including passing yards and points scored. Also during his tenure, Cornell receivers were named to the first and second All-Ivy team in both 2011 and 2012. In 2011, receiver Shane Savage set Big Red single-season records with 65 receptions for 1,080 receiving yards. Condell also spent three seasons as Offensive Coordinator and Quarterbacks Coach at Southeastern Louisiana (2007-09), and served as acting head coach during the final six weeks of the 2008 season. Condell has additional significant CFL experience, with stints as Offensive Coordinator with the Saskatchewan Roughriders (2006), a dual role of Quarterbacks and Receivers Coach with the Ottawa Renegades (2004-05), and Special Teams Coordinator with the Winnipeg Blue Bombers (1997). Throughout his coaching career, Condell has oversaw every position on offence, with stints at Louisiana-Monroe, Stephen F. Austin, McNeese State, Hamilton College and Illionis Wesleyan, including a stop with the Albany Firebirds of the Arena Football League. In addition to his vast coaching experience, he served as a personnel assistant to the NFL Europe draft in 1998. Condell also played receiver at Lock Haven University and Cortland State, helping the school capture a pair of ECAC titles in 1992 and 1993. He earned his degree in physical education at Cortland in 1992 and a master’s degree in kinesiology from Stephen F. Austin. Condell and his wife, Mandy, have four sons: Caleb, Luke, J.T. and Wyatt.